Preparing some of the hundreds of new plants. 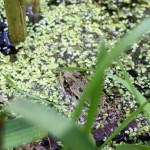 Today Froglife joined us on our wildlife ponds to continue to improve the area for wildlife. 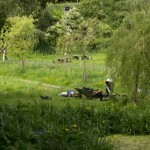 A few months since our big cleanup, the ponds are looking much better and teeming with wildlife. 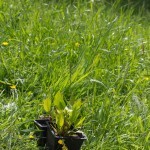 However, some of the more aggressive plants have begun to dominate the area and we can make the ponds even better for wildlife by encouraging greater diversity in our plantlife. 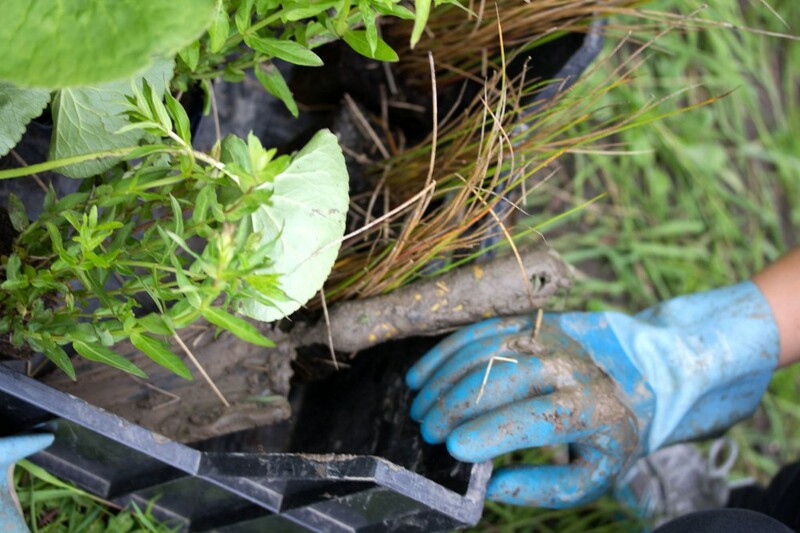 To help us do this, Vanessa Barber and Alex Draper from Froglife came down to help us plant up the ponds with a greater variety of native species. Armed with over 300 individual plants of many different species, we worked to add a range of textures and habitats to the ponds. 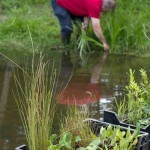 Our aim is to create lots of different areas to the ponds, including open water spaces as well as planted areas along the edges (with great growth for emerging invertebrates like damselflies and dragonflies), as well as vegetation beneath the water to provide food, oxygen and shelter for aquatic life. Last but not least we can add floating plants, which wildlife can use as refuges and an anchor for their eggs. We spotted lots of wildlife during the planting including frogs, newts, spiders, bumblebees, damselflies and beetles of all sorts. It’s great to see wildlife making our ponds home and we hope the new planting and other new wildlife initiatives will encourage even more wild creatures to take up residence. The new plants add a variety of textures and environments. 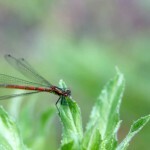 A large red damselfly visits the ponds. Some plants will grow in the ponds as well. Farm manager Nick gets stuck in. A beautiful day for planting. 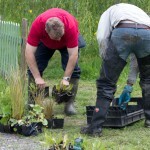 Removing unwanted growth ahead of planting. One of many frogs we encountered! 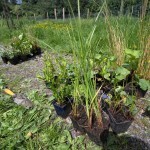 New plants in the sunshine, awaiting planting.